Whether you know it as Uluru or Ayres Rock, this National Park is possibly Australia’s most famous, most visited and most iconic. 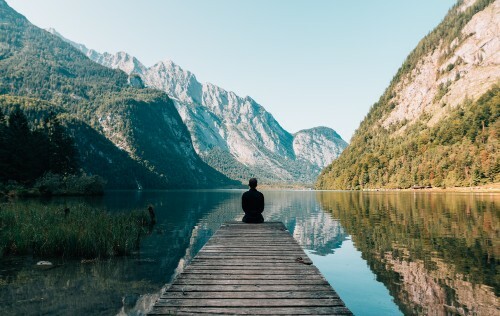 The fact we were able to travel there in our little old camper van has been one of the best experiences of our entire trip and we wanted to take you on that journey too. 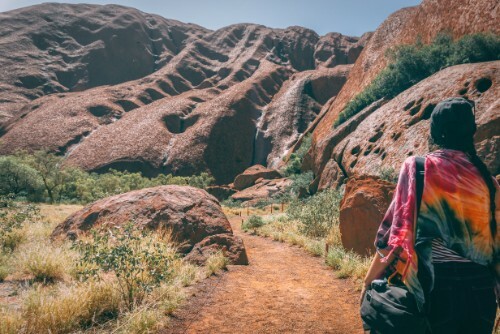 So here’s our ‘step-by-step’ guide to help you know what to expect from the Uluru Base walk along with what you can get up to once you’ve walked your little legs off! The Uluru and Kata Tjuta National Park is in Australia’s famous Red Center, it’s the heart of the outback and one of the most remote area’s of the continent. That doesn’t mean it’s impossible to get to though. 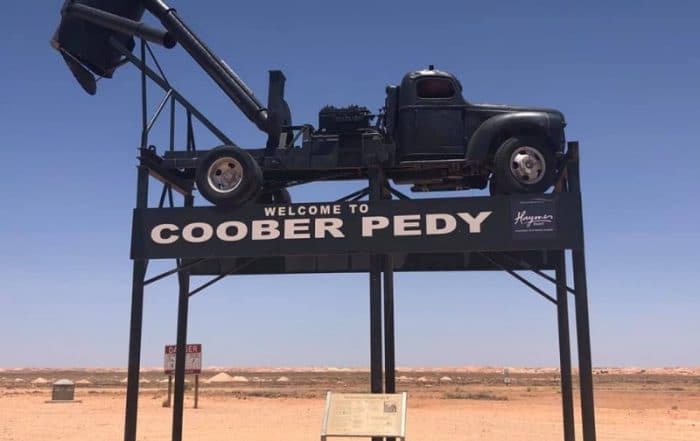 If you’re travelling in you’re own car, like us, and fancy taking the ultimate Australian road trip you can drive inland from Townsville straight through the outback to the centre road (Stewart’s highway). This road heading west is made up of some of the longest, flattest straight roads we’ve ever been on and they literally go on forever. You can also head North from Adelaide which is the shortest route to Uluru by car at ‘only’ 17 hours away. 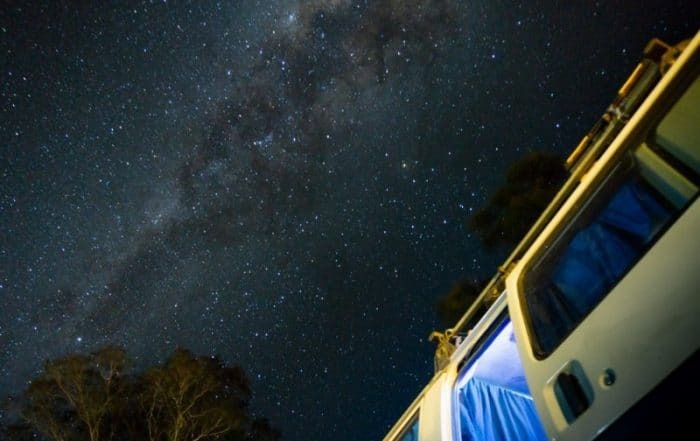 An alternative way of getting to Uluru is via plane, either flying into Alice Springs and getting a shuttle bus to your Uluru accommodation or flying to the Uluru Airport and again getting the shuttle bus. 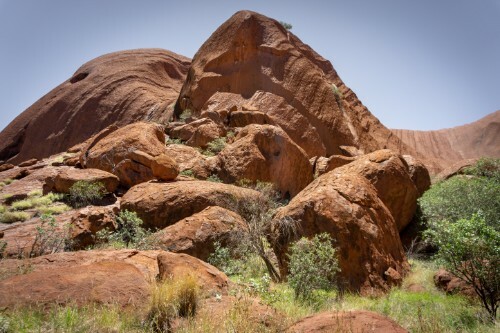 I obviously can’t tell the story as well as what you’ll learn at the Uluru and Kata Tjuta national park but you’ll soon realise that it’s far more than just a big red rock. 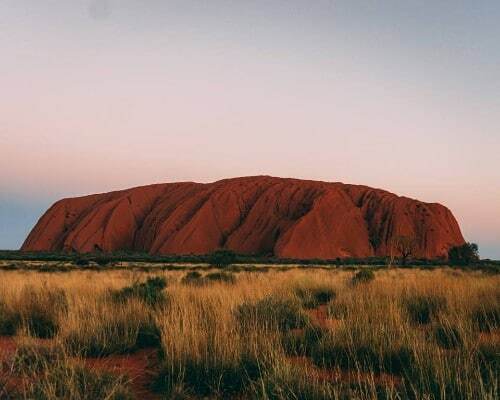 There’s a history there that goes back to the dream time – The Aboriginal stories of creation – and it’s said that aboriginal tribes have lived at Uluru for over 20,000 years! The traditional landowners believe Uluru dates back to the time of creation, to when ancestral beings roamed the earth and ultimately created humans. This is what gives Uluru its sacred title and also why parts are closed off to photos. 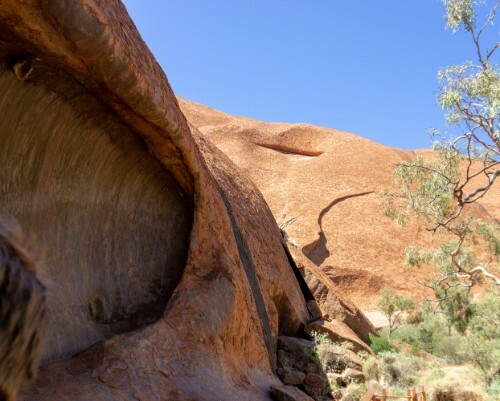 Ever considered doing the Uluru climb? You’ll hopefully reconsider once you learn about it’s importance to the local people. Around the 1920’s European settlers had started visiting Uluru and actually set up camps and hotels (of sorts) around the base of Uluru, the 1940s saw Aboriginal reserves reduced in size in favour of mining exploration and by 1950’s a dirt road had been constructed to allow tourists and minors better access to the area. By the ’60s tours were running to Uluru and climbing to the top was a popular activity. It wasn’t until 1976 that the land was officially handed back to its original owners along with an apology from the Prime Minister. Now Uluru Kata Tjuta National Park is maintained by the traditional landowners and open to the public. 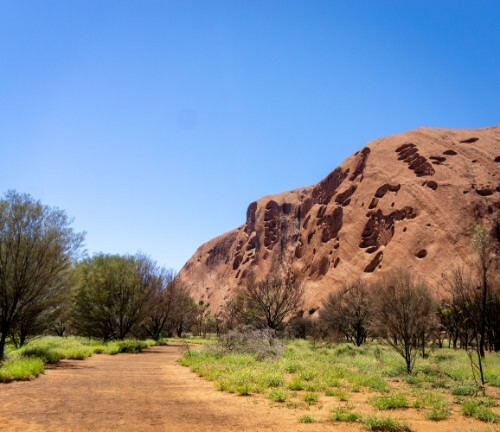 The old camps are long gone and there are a lot more rules in place now to help keep the land healthy, something to consider if you’re thinking about climbing Uluru – something that isn’t yet banned but is heavily frowned upon. Want to see our posts and videos before they’re released? Check out our Officer Travels Members page! Our first morning at Uluru National Park didn’t start as early as we intended it to and we ended up driving into the park a little over 10 am. This was when we learnt about the walking track closure times, which are dictated by the weather. On this particular day, it was forecast to hit 41’c and that meant from 11 am the far side of the Uluru Base track would be closed and there was an advisory out that all walks should be finished by 10 am… The base walk was apparently going to take around 3.5 hours, according to the guides we were given at the entrance. All we could do was hope that we’d get into that section before the weather got too hot. The bonus, however, was this meant all the sensible visitors were nearing the end of their walks and the park was eerily quiet. It was also nice to see the Uluru climb had been closed at 8 am too, so we didn’t have to witness people disregarding the aboriginals wishes by climbing on their sacred rock. 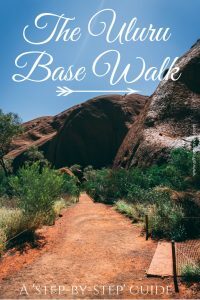 The Uluru Base Walk is a 10.6km, grade 3 walk that has a recommended walk time of 3.5 hours, there’s also only ONE water refill point along the route. With that in mind, we stocked up our backpack with 3litres of water from our own supply, through in heaps of snacks and headed on to the track. Up until this point, we’d only seen Uluru from a distance and from there it was impressive enough, it was so much bigger than we expected. But being up close to it really hit home that we were here, in the middle of Australia and while this wasn’t by any means the end of our trip it definitely felt like our goal had been achieved. We started the walk at the Mala Car Park, due to how late in the day we were starting we hoped that walking the loop clockwise would mean we’d follow the shade around instead of going anti-clockwise and having the sun beating down on us for 3 hours. This turned out to be a good choice as once you hit the middle section of the track, there is little to no tree coverage so having some shade before and after was a welcome relief; we could see why they choose to close it. 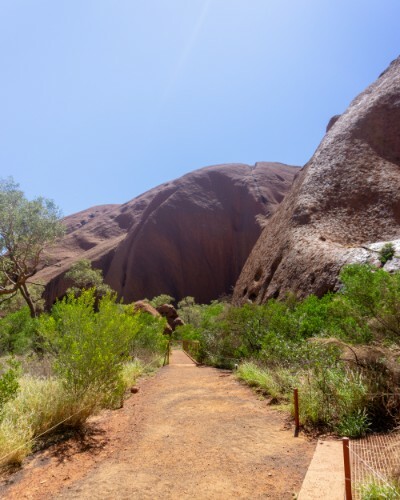 The first part of the Uluru Base Walk covers the Mala Walk and leads you to Kantju Gorge. This is where the Mala people camped when they first found Uluru, there’s even remanence of Aboriginal paintings still on the rock. The last things we expected to find at Uluru was water but at Kantju Gorge there’s plenty around, especially after rain. Standing next to the waterhole with rock towering above us, it was easy to see why they chose to live in the oasis in the desert. With nobody else around we sat and soaked in the atmosphere that Uluru oozes, it’s a weird calmness that takes over you. 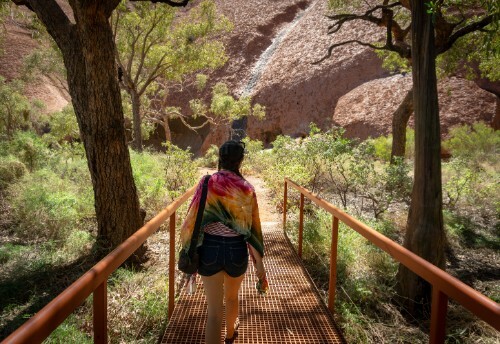 The Mala walk can be done as a separate walk to the Uluru Base Walk and is only a 2km / 1.5hour return walk from the car park. They also run tours lead by an aboriginal ranger – something I wish we’d woken up sooner to do as they start at 8 am in the summer. As we walked the back section of the Uluru Base Walk – already 90 minutes in – we were really surprised at how Uluru looks from this side. This side is never photographed so we had no idea it would be so different. There are cave-like formations near the top, black tiger stripes from where waterfalls have stained the red rock over time (yes! waterfalls!) and even grass growing in some of the crevices. Boulders scatter the bottom, some are perfectly round like at the Devils Marbles while others look like they’ve been sliced with a hot knife. I’d love to know the stories about this area but then I guess it would take away some of the magic, the mystery. You really do have to see it for yourself to ‘get it’. On the western corner of Uluru is where you’ll find Taputji, the ancestral kingfisher spirit that used to watch over the women in the tribe. This is another impressive rock formation that stands separately from Uluru but is a strict no photography zone. The path wound out away from Uluru and behind Taputji to prevent temptation. While most would say this is the ‘most boring’ part of the Uluru Base walk because it’s not got the best vantage point of Uluru (or Taputji), the scenery in the rest of the area was really interesting and it wasn’t long before we were passing Kuniya Piti on the west side where the path is running alongside Uluru again. Kuniya Piti is where the only water refill station was and after almost 3 hours we were in need of a refill. This water is treated and filtered rainwater but it doesn’t have the best taste – we conquered that by using an electrolyte powder and turning it into juice instead. Our favourite section of the Uluru Base walk was the Kuniya walk to the Mutitjulu Waterhole. This is where the rock formation digs into Uluru a little to form another gorge where there’s another watering hole, some caves and a really interesting Dream Time story of creation. Thankfully photo’s are allowed here so we can show you what we’re talking about. Wanampi the Ancestral water snake, the Mala people tell the story of how this section of Uluru was created. Here’s a link to the full Dream Time Story because no matter how hard I try I won’t be able to do it justice. While the story tells of a war between two serpents, the signs also point out markings on the rock, letting you track their movements as if you were watching it play out in front of you. It was in this moment that we fully began to appreciate where we were and how lucky we are to still be able to visit such a sacred site. Like the Mala walk, the Kuniya walk can be done as a solo walk from it’s car park. There’s no guided walk for this gorge but the story is well sign posted! From the Kuniya walk, we were ‘only’ about an hour from the car, the front portion takes you alongside the road, passing Uluru from an angle we’d already seen so we didn’t hang around too much on the walk back and not gonna lie – I needed to pee too. How long does it take to do the Uluru Base Walk? The Uluru base walk took us just under 4 hours in total at a steady pace taking time to actually look at what was going on around us, we could definitely have ‘done it’ quicker but we weren’t there to break records. Overall, the walk is very easy and flat; we managed in flip-flops, even if our feet did look an odd colour by the end. The Uluru Base walk is pretty easy if you don’t account for its length or the heat. On a mild day in the winter, it would be a really enjoyable walk for all ages. In the 40’ heat in summer the back section was tough at times, especially with the limited water refills. But I guess that’s why they issue warnings and close sections off after 11 am. As long as you know what to expect from the Uluru Base Walk and prepare for all weathers you’ll be fine. It was almost 3 pm by the time we reached the Uluru Cultural Centre so it was very quiet around, everyone else must have been hiding in the pool back at the Yulara Resort and I can’t say we blamed them; it was already pushing 40’c, I swear the warm red sand made it feel a whole lot worse too. Thankfully the Cultural Centre’s aircon was working which encouraged us to take our time reading the information boards and watch the documentary video about hand back day. We didn’t realise there was a full museum at Uluru as well as a couple of gift shops, a cafe and an art centre where you can watch Aboriginal women hand paint canvases with the traditional methods – the patience they must have to do such big pieces is incredible. We really appreciated learning more about the Aboriginal history at the Cultural Centre, it isn’t something we get taught in schools over in the UK but I think it’s a really important piece of history to know about. Especially when it comes to the Europeans moving over, Hand Back Day and all the modern day politics that are still happening today. The sun went down quite late at the red centre during summer but we anticipated big crowds at the car park for the sunset view, so we chose to get there early. 3 hours early. We picked a good spot, rustled up some snacks and rested after our big walk in the morning. The carpark is laid out in a way that every space has a good view; the trick is getting there in time to actually get a space. By the time the sky started lighting up like fire, all the spaces were gone and cars started pulling up randomly behind parked cars. People got out there cars and crowded the fence; some even standing directly in front of people that had set up chairs and were having a picnic with what was supposed to be an amazing view. Again, we’d anticipated this and set up our camp on the roof which is just one of our bonuses to travelling to Uluru with a camper van! Sunset over Uluru is magical, I know it sounds like a cliche and something you’ll have heard everyone who’s been say… but that’s because it’s true. The colours over the red rock and the way Uluru itself changes colour is spine-tingling, it’s as if the rock is coming alive for the night. After reading some of the Dream Time stories, that was a very real possibility. Driving back to camp we were able to catch a glimpse of Kuta Tjuta lit up in the evening colours. A mix of the head, the colour of the rock and red sand in the air turn everything turns a vivid shade of red here at sunset so no matter where you choose to end your day, you’re pretty much guaranteed a beautiful view. What to expect from the Uluru Base Walk?… Dirty feet! 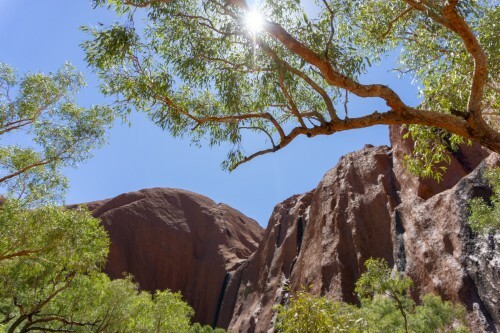 There’s plenty more to do at the Uluru and Kata Tjuta National Park, we’ve got more posts coming up over the weeks covering why you need to do The Valley of the Winds walk, a guide to surviving the outback heat and what we wish we’d known before visiting Uluru. If you want to get your hands on these before they hit the blog, join us on Patreon to get an exclusive preview – including a first viewing of our Darwin – Uluru video! Have you been to Australia’s Red Center? Was it everything you expected, or did it let you down? We’d love to hear your thoughts and experience! Let us know in the comments or join us on Facebook! Things to know about Uluru before you go! 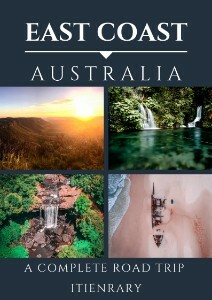 Haven’t been down under, but have read about this place and heard about it many times. But I really love this insightful article, as I found it quite helpful as a first time traveler. I would really love to witness the sunset, despite it being a cliche thing to do. The Uluru Base walk sounds really thrilling. What a way to get a fresh and new perspective of the landscapes. 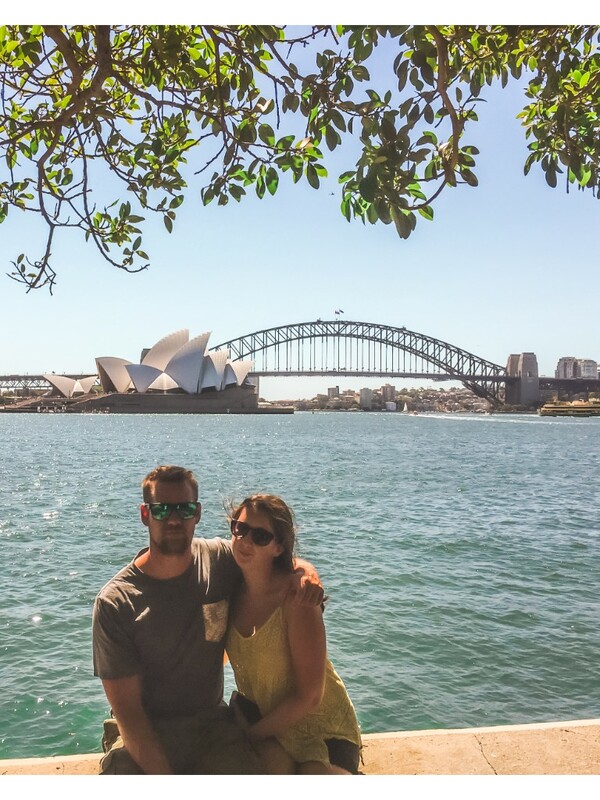 This is a place that is relatively less explored in Australia and hence the experience seems even more interesting. Really love the kind of wild beauty of the landscapes in the region.It is so heartening to see that climbing to the top is not encouraged. We need to ensure the sustenance of our natural treasures. Recently I read about the Mt. Everest being overrun by trekkers and slowly being impacted! You’re so right Sandy! That’s why we’re pleased to see the Uluru climb being closed soon. I can imagine Mt. Everest is suffering a bit too, I’ve seen a huge increase over recent years in people doing that climb. I love the photo of your feet! But you went wearing flip-flops or proper shoes? I expect it wasn’t an easy walk, and not just because of the hear. Haha yea, we do most things in our flops, including the base walk. Luckily this walk is flat so it was pretty easy, just a little dirty. Hi! This looks like an awesome hike. The blistering heat would surely make it hard but those views make it so worth it! Thanks for including that video. It is a beautiful compilation, well made, nice music, I just loved it! Keep it coming guys! It’s great that the Australian government returned ownership of Uluru to the Aboriginals. It’s even better that they still allow people to enjoy its beauty! Isn’t it!! We’re so lucky. Have you been to Australia Darah? I would love to do this walk around Uluru. I knew I cant walk to the top of the rock but to walk around it and see this beautiful nature is truly amazing. What an amazing experience. 4 hours in flip flops, impressive! I loved the focus on the history and cultural aspects of Uluru. Thanks for sharing. Wow, what a trip. I’m a total fan of places that have something to offer historically and culturally. I like how you worked it out and illustrated it, thanks for the information. Love this article. Thank you SO much for including the note on why not to climb to the top – it’s so important that those voices be heard! 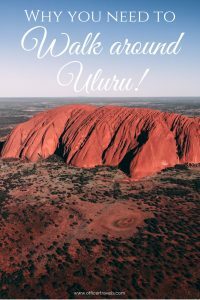 I spent a few months living in Sydney so I never made it to Uluru, but I’ll certainly be back one day with the intention of visiting! I hope you get a chance to Lauren! It’s amazing, and yes, thankfully there are plans in place to close the climb perminently in October this yes, but that won’t heel the scar that’s been left on Uluru. Nature is inspiring in all its shapes, sizes and colors, isn’t it? 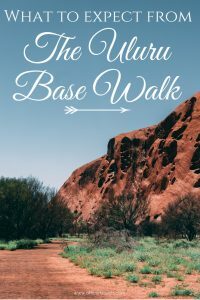 The base walk to Uluru sounds fascinating. What is the best time of the year to plan for it?